Click here for information on booking a guided fishing trip with Miss Kitty's! 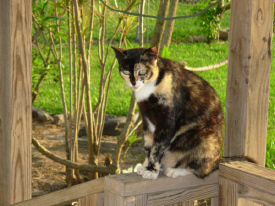 Miss Kitty was a sun-faded calico who lived on the back porch of The Original Miss Kitty's Fishing Getaway house. When I bought the house in 2004, I agreed to keep Miss Kitty who was about 14 years old at that time. I named the house after her and began renting it out to people who loved to fish. The vacationers always fed and took care of Miss Kitty and many came to love her just as I did. Miss Kitty's favorite treat was fish bellies. The neighbor, JD, fed her many fish bellies over the years and towards the end, she liked to sun on the deck at JD's house. 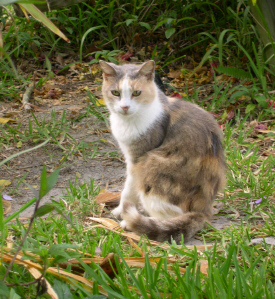 Miss Kitty was joined by a younger calico a few years back that we call Miss Kitty 2. She will actually join you out on the pier while you are fishing! Miss Kitty has some notable fans such as a young girl named Kaitlyn who spent several birthdays fishing at Miss Kitty's. Kaitlyn was there for Miss Kitty's memorial service when she passed away early in 2010. Another fan is our very first customer who has returned to Miss Kitty's once or twice a year since we've been in business. He continues to write detailed accounts of his fishing excursions on every visit in our log books. Speaking of log books, I have 3 log books full of Miss Kitty's fishing tales. 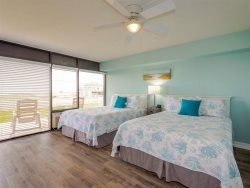 Be sure to check out the log books at each of our rentals and add your own stories! I also invite you to share your stories and photos on our FACEBOOK page.